Vauxhall Motors Ltd letter from 1928. Homepage. This page: An item of correspondence between Vauxhall and a car's owner in the 1920s. 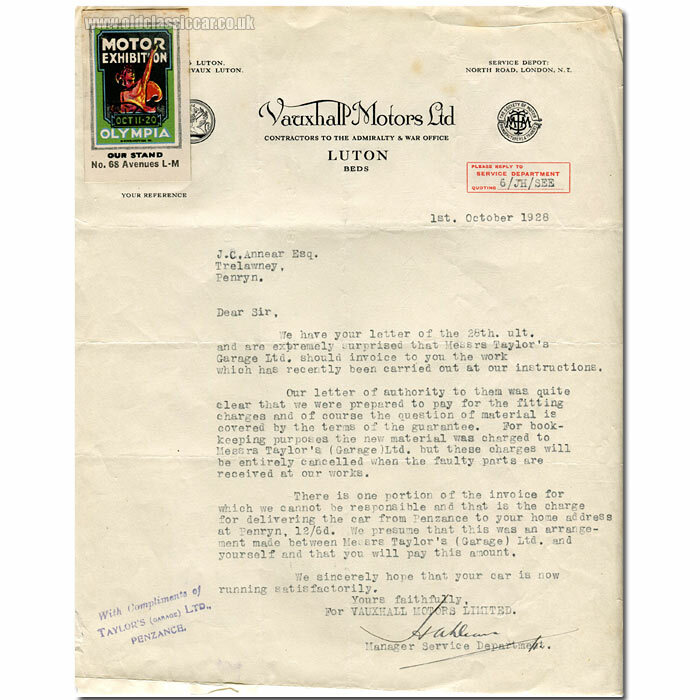 The Service Depot for Vauxhall Motors Ltd was situated on the North Road in London, at the time of this letter - October 1928 - and is signed by that department's manager. The letter relates to repair work that was undertaken by Taylor's (Garage) Ltd, of Penzance, to Mr J.C. Annear's Vauxhall. The aforementioned gent was clearly "put out" when he received an invoice for the work done to his car, after receiving assurances from the car's manufacturer that both materials and labour charges would be absorbed by them, rather than the owner. The only charges that Vauxhalls wouldn't be covering were for the transportation of the car, from Mr Annear's home in Penryn, to the garage in Penzance, both in Cornwall. Stylish lettering for the company's full name - Vauxhall Motors Ltd - "Contractors to the Admiralty & War Office" - appears on the letterheading, as does the logo for the Society of Motor Manufacturers and Traders, both organisations which are still very much in existence. The paper used was Canadian-made "Victor Bond" brand. Note the gummed label at the top left, promoting the 1928 Motor Exhibition to be held at Olympia, October 11th-20th. Who was J.C. Annear, owner of this vintage car? I can find a reference to a coal merchant operating in Penryn of that name, in the late 1920s, so perhaps this is the same person. The same town was also the home to someone of this name operating a builder's merchants in later years. But what of the garage, instructed to work on this gent's Vauxhall by the manufacturer itself? A page on the BBC's "People's War" website makes reference to Taylor's Garage being flattened by the Luftwaffe in the war. The 1928 RAC Handbook gives its address as CoinageHall Street in the town, as does the 1949/1950 edition (so presumably it was rebuilt), although now a second presence - at Green Market - is also given. An overhead view of Penzance in which Taylor's Garage can be seen, probably post-war, may be found on this flickr page. Alas no mention of which Vauxhall Mr Annear owned is given. For it to be covered by the maker's warranty it would have needed to be relatively new at the date of this letter (10/1928), so it could well have been a 20/60 for example, a model introduced just the year before, in 1927.